I don’t believe in twisting yourself into knots of excuses and explanations over the food you make. Neither do I, Jules. And for that matter, I don’t believe in twisting myself into knots of excuses and explanations over the food I eat. Food was, before cloth became fashion, before sticks and stones evolved into architecture, and definitely before the inception of the word “definition”, the one variable that defined human society, its tragedies and its genius. It might be useful to restrict what I mean when I refer to “food” to be separate from sustenance. We eat not because we are worried about surviving long enough and well enough to produce offspring, but because there is pleasure in eating. While humanity is without a doubt exclusive, it can be difficult to pinpoint what it is that makes us so special. Some might say it’s our advanced use of hands to manipulate materials into tools. Capuchin monkeys do that too, but I’m not about to invite them to my Thanksgiving family dinner. Others might say it’s our level of intelligence. Please, let’s not flatter ourselves and have those cetaceans with their permanently sarcastic smiles actually laugh at our ignorance. Food, however, may be a simple way to mark the line between us and everything else. Specifically, if we define “cooking” as a process by which we alter the taste of an edible substance such that it might improve the experience of the eater, then we might have hit the jackpot. You might object and say that raw foods such as fruits and vegetables have not been processed in any way. Yet, cultivation in and of itself is by the definition above a form of cookery as the farmer, in order to compete with other farmers, must strive to produce a better-tasting crop and therefore uses anything from selective breeding to fertilizing in order to achieve his objective. What about sashimi? Well, it is probably one of the most intensely monitored, controlled, and complex processes a food can be subject to. Take tuna for example. The time and location of ‘harvest’ matters due to the migration routes of the schools; in particular, fish that have reached their spawning grounds are less desirable as they are exhausted from the long swim and there is less fat and usually a metallic acidity in their flesh. The way they are captured matters; line caught is always better as the fish doesn’t drown before it’s hauled on board. Then there’s the speed and temperature at which it is flash-frozen as the quicker it freezes, the smaller the ice crystals and therefore the finer and more delicate the texture. Oh, we also want to defrost the fish nice and slow (also at a controlled temperature) so we don’t end up with a dry lump of bluefin swimming in its own juices. Then there’s the slicing and presentation that’s got diners at Tokyo’s Jiro-Sushi paying ￥30,000 for dinner (about $300). Food is worth celebrating. But not because of what it is, because it is nothing if not for the mind and hands behind it. It says nothing about what we are. We are not what we eat – from a green-stemmed banana to sous-vide short ribs with. Rather, we are how we see food. Take your pick, be a glutton, an innovator, an obsessive compulsive label-checker, an artist, a purist, a gastronomane, or a snob. The way you see food is your choice and you have control over that part of who you are. Why not be someone you’ll like? 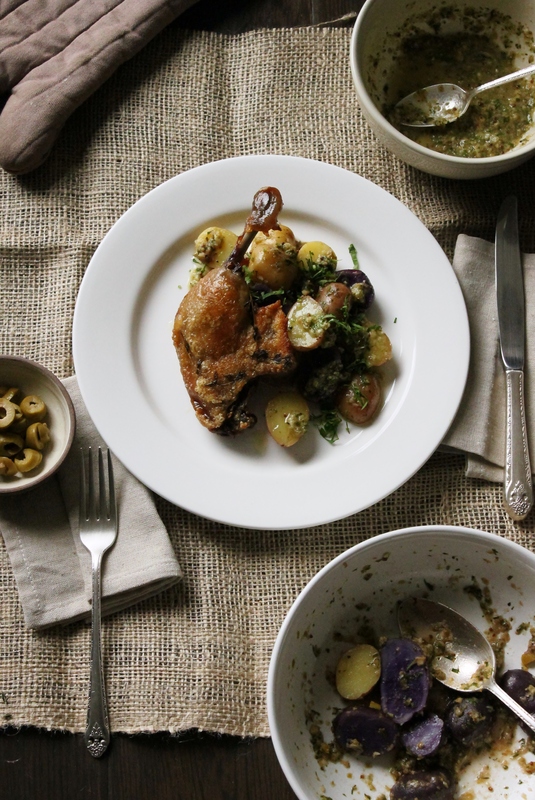 The word confit stems from a family of words that all huddle around the meaning of preserving. As most preservation methods are, the process of confit-ing was likely a peasant sort of dish as opposed to the reputation it occupies today. The breasts, which are more tender, quick to cook and best consumed fresh, were probably eaten first (or sold to wealthier folks), and the tougher quarters would be left to less à l’aise. In this context, confiting serves a few important purposes. In addition to substantially extending its storage life, it also stretches a small amount of protein to yield immense flavours. For example, the classic cassoulet uses duck confit as a seasoning to enhance the depth of what is essentially a pot of baked beans. However, you’d end up sacrificing the crackling that’s literally addictive as crack (and dare I say better than peking duck). Not the case here – just look at that crisp gold overlay. To make the duck confit, you first need to cure it – this will tighten the muscle fibers, making them more tender once they cook up and prevents them from drying out once they’re in the oven. To do this, simply rub the duck legs liberally with the sea salt. 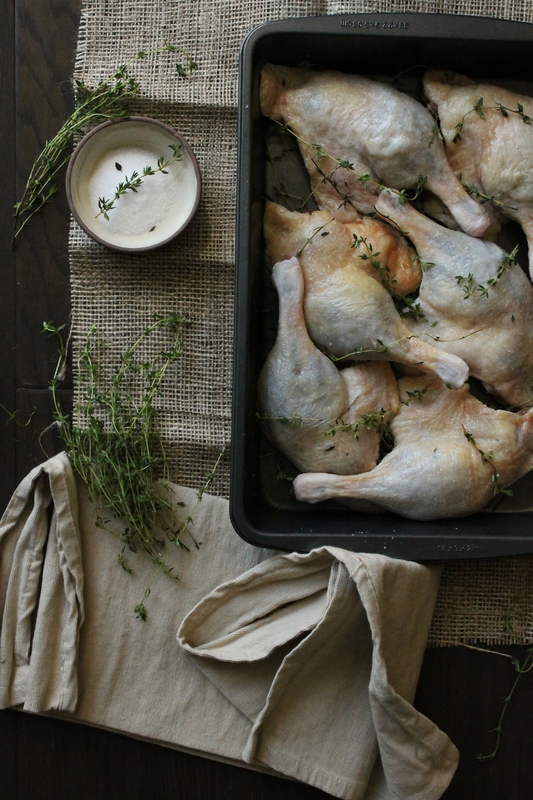 Line the bottom of a baking dish with a good layer of thyme sprigs, then arrange the duck legs, skin side up, in the dish. Cover tightly with foil then pop it in the fridge to cure for 2 days. On the third day, take it out of the fridge and send it straight into the oven – no need to preheat here. Turn it on to 300 degree F, and let it bake for 3~3 1/2 hours, or until the fat has completely rendered out and the skins are richly caramelized. Let it cool down to room temperature, uncovered, before transferring the to freezer bags in which you can then keep them in the freezer for at least 3 months. Tip the rendered, thyme-infused duck fat into a small jar and store in the fridge. I use the duck fat to roast potatoes and fry scallions for duck fat dry ramen. Don’t waste the flavour-bomb brown bits left at the bottom of the dish either. Flood the dish with water and bring it up to a simmer to lift up all those bits to make a beautiful complex stock, which you can take further by infusing with star anise, ginger root, szechuan peppercorns, dried orange peel, and a couple dried chinese jujubes. To make the potato salad, boil the potatoes in generously salted water just until tender, about 15-18 minutes. Meanwhile, pulse together the olives, garlic, anchovy fillet, parsley, lemon zest, mustard, and honey in a food processor until a chunky mixture forms. Scrape it into a large salad bowl and stir in the olive oil and lemon juice. Season with salt and freshly cracked black pepper if necessary. Once the potatoes are cooked, refresh them under cool water just until cool enough to handle – thy should still be quite warm. Halve the potatoes and toss with the green olive vinaigrette. Adjust the seasoning to your liking with either some more honey, or a bit more salt and black pepper. Beautiful dish! Photography is stunning too! Thanks Rae, glad you liked it! I love duck confit! J´adore! Je l’adore aussi! It’s like bacon, only much, much better.